Photo courtesy of Shelley West Clark, XXII Photography Crestline’s Davon Triplett goes in for the fancy flush during Saturday’s non-conference clash with the visiting Vanlue Wildcats. Triplett recorded 27 points and 22 rebounds for the double-double in the Bulldogs 58-51 victory. CRESTLINE — After their loss on Friday evening against conference foe Mansfield Christian, the Crestline Bulldogs were back at it, at home, on Saturday, February 10 against the visiting Vanlue Wildcats. The Shoot for the Cure game between the two teams would prove to be a true back and forth contest. Crestline would begin the game ahead, leading 12-6 after the first eight minutes of play. However, the Wildcats would storm back by scoring 20 in the second to take a 26-22 advantage into the locker room at halftime. After the intermission, the hosting Bulldogs would edge Vanlue in the third, 11-10. It was the fourth and final quarter that would prove to be the decision maker as Crestline put up 25 points while their defense held the visitors to just 15 en route to the 58-51 victory. The ‘Dogs moved to 7-11 overall on the season with the victory and remain at 2-6 in Mid-Buckeye Conference action. Davon Triplett had a monster night for the home team on Saturday, dropping in 27 points to go along with 22 total rebounds (6O, 16D) for the double-double. Triplett also dished out two assists, had two blocks and swiped two steals in the win. Max Anatra was the only other Bulldogs player in double figures, scoring 11 points while grabbing two rebounds, dishing two assists and recording a steal. Other stats for Crestline in the win were: Team- 21/47 total field goals, 18/33 from the interior, 3/14 from the perimeter, 13/23 at the free-throw line, 47 total rebounds (16O, 31D), 12 assists, 5 steals, 4 blocks and 21 turnovers; AJ Watkins- 7 points, 5 rebounds; Kevin Winkler- 5 points; Zach Gregory- 4 points, 4 rebounds, 2 assists, 1 block; Ty Clark- 2 points, 5 rebounds, 2 assists; Logan Ronk- 2 points, 2 rebounds, 1 assist; Gavin Balliett- 1 rebound, 1 assist, 2 steals; Kaden Ronk- 2 assists, 1 block and Caleb Hoskins- 2 rebounds. Another weekend doubleheader awaits the Bulldogs as they play host to conference foe, the Central Christian Comets on Friday, February 16 and then another home contest on Saturday against the visiting Galion Tigers. On Wednesday, February 21, Crestline will play their final home game of the season against the visitors from Cloverleaf. The regular season will wrap up against the Loudonville Redbirds, on the road, on Friday, February 23. MANSFIELD — On Friday, February 9, the Crestline Bulldogs boys hoops squad made the short bus trip to Mansfield Christian High School to meet up with the Flames in MBC play. It would be the Flames avenging their loss from earlier in the year at Crestline, defeating the visiting Bulldogs; 63-53. Anatra and Triplett would both finish in double figures for the visitors, contributed 10 points apiece in the Crestline effort. Watkins would chime in with nine and Clark with eight for the Bulldogs in the defeat. 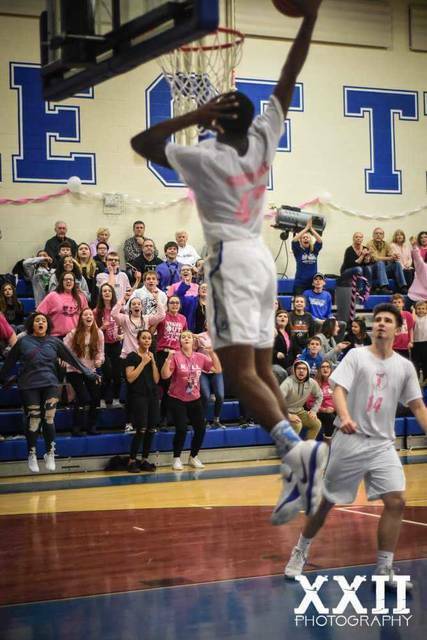 Other stats from Friday for Crestline were: 21/50 total field goals, 18/33 from inside, 3/17 from outside, 8/10 at the stripe, 36 total rebounds (11O, 25D), 10 assists, 7 steals, 5 blocks and 12 turnovers; Anatra- 3 rebounds, 1 steal; Triplett- 5 rebounds, 5 blocks, 1 steal; Watkins- 5 rebounds, 3 assists, 2 steals; Clark- 4 rebounds, 3 assists; K. Ronk- 7 points, 2 rebounds; Hoskins- 4 points, 4 rebounds, 1 assist, 1 steal; Gregory- 2 points, 3 rebounds, 1 assist, 2 steals; Winkler- 2 points, 2 rebounds, 2 assists; L. Ronk- 1 point, 1 rebound and Balliett- 1 rebound. https://www.galioninquirer.com/wp-content/uploads/sites/38/2018/02/web1_Davon.jpgPhoto courtesy of Shelley West Clark, XXII Photography Crestline’s Davon Triplett goes in for the fancy flush during Saturday’s non-conference clash with the visiting Vanlue Wildcats. Triplett recorded 27 points and 22 rebounds for the double-double in the Bulldogs 58-51 victory.